Discussion in 'General Domain Discussion' started by Andrew Wright, Nov 10, 2018. Hello. I am new here, and although I added it to yesterdays dropping domains forum discussion it didn't drop today. Am I looking at the drop list incorrectly? It was listed as PD. I wasnt going to bid for it anyway, not even going to try and compete but it looked like the best name on the drop list. It looks as though the registry is holding it for some reason and not letting it drop. Very irregular. Sorry for the late post, I don't check DNT as often as I used to. Our general policy is to list it all and then try to figure out the anomalies later. We will however be looking to block the reserve list domains shortly as there seem to be more and more of them coming up every month. There are quite a few generic domains deleted already which have raised a few questions like banking.com.au and australia.net.au. 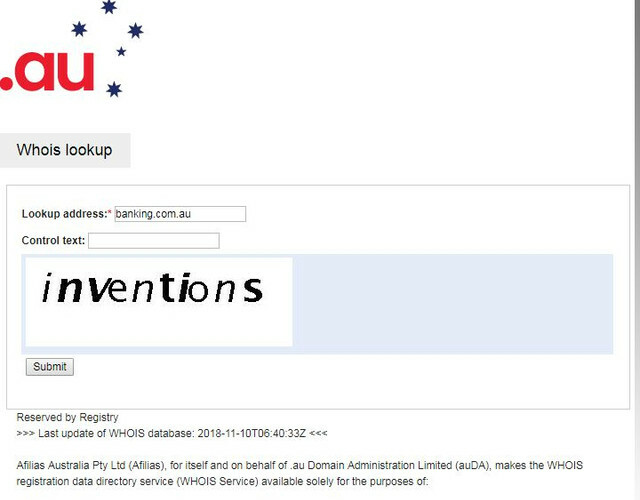 There are also domains like ran.com.au which are coming up and might also raise questions. For me I'd like to see the domains deleted rather than blocked from being renewed as the deletion process gives a registrant a right to internal and external review. Either way the registering of these exact match domains is currently blocked and the future expansion of the list is also open to changes, so I suspect this might become part of the au landscape much like the misspelling list which occasionally raises its head to confuse registrants. ING Bank paid auDA for Banking.com.au at the auDA Generic name auction previously. Australia Bank Ltd bought smartBanking.com.au, ING Bank (Australia) Ltd bought mortgage.com.au and Banking.com.au "
auDA, Ausregistry and the Registrars have had no problems profiting from the sale and renewals for the last 16 years! ING bank, Bankwest, St George, NAB, ANL etc should sue auDA and the Board Directors for this crazy backflip.